I had been gardening in the city for some years. I don’t remember ever wishing to move into a country place, particularly, but my city neighborhood was deteriorating and my family size was increasing. My interest in history, and then gardening, began to branch towards homesteading. It was the seventies that developed that trend, and so by 1980 I found myself here on a plain that was so flat that it looks as though God took a plasterer’s knife and scraped it hard across the land. The farmers took things further in the ’60’s and began felling all the trees in sight. All for endless acres of corn and soybean. 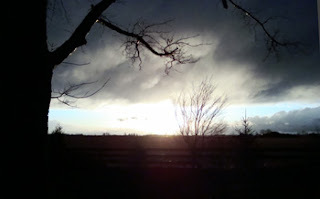 Until I began planting there was very little between me and the far horizon westward. One can see storms coming from a long way off, their anvil-piled wrath thundering in from the west. 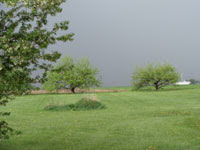 Long pale gray strips of slanting rainfall give sight to storms across the landscape far away. In the aftermath are visions of light rays that step forth from the masses of breaking clouds. Sunsets, too, are bright and unhindered, now only trimmed at their horizon line by my trees and bushes. But there are places, still, where one can see the sun melt into earths crust, sherbert colors left too long upon the sky’s table, inking dark the night with its liquefied rays. Twilight is a Parrish painting of silhouette against an oddly transparent blue, like looking long into a darkly clear ocean. This is the best part of being on the cusp of a visually endless plain. As a gardener I was impressed by the soil, and knew nothing yet of the domineering winds which cut through this garden at all times of the year. The soil is what was left from the wet prairie which kept this area unpopulated and uncultivated until relatively lately… when after the cattle barons of Ohio (oh, yes, there were some, once) gave way to inventive farmers who laboriously dug deep ditches to carry off the ponded water which had disallowed cultivation until too late in the growing season. My property lays at the head of one of those deeply dug ditches, the only elevation difference in the land, unseen until nearly upon them. The Midwestern Haha. I know my little acres were once very different than when I arrived here, as I had met and talked with a former occupant of the house whose father had purchased this place in 1915, when she was a young girl of 16 years. But by my time, the oaks were gone, the orchard no more, and only the silver maples were the trees that hugged the house incongruently with a misshapen Norway spruce, whose own story was one of tornado force winds tearing out its upper parts leaving opened arms reaching out for mercy. Two of the largest arborvitae I had ever seen stood marking a long, longgone, front path which she told me was the place she and her brothers rode bikes straight into what was then a ditch her depression era father paid to have covered… for fear of his children’s wellbeing. I realized then that arborvitae are not shrubs for foundations or in proximity to a house… they are full fledged trees when mature. From signs at the corners of the house it seems some were once planted there as well- remaining long past the time they could be tolerated, or should have been. The house had the unwelcoming hodgepodge of partly planted, partly weed grown things around a deeply listing front porch, I pulled out a number of weedy silver maple tree saplings and gave them to a neighbor. Helped her plant them, actually. The crowded mailorder (I’m pretty sure!) combination of forsythia, weigela, and bridal spirea were all cramped into the area under the front window. I dug each one out and moved them to far reaches of the property. 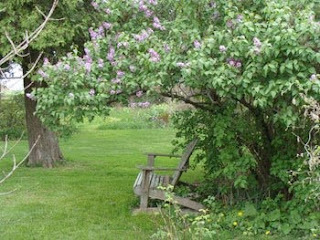 a large rangy growth of lilac with an empty center remains in the front. It embraces my garden bench and presents offerings of common lilac each spring. It has too much history to cut down, and I am too old now to attempt it, anyway. It will likely outlive me. Most of the yard was mown grass. Something in me does not love a lawn, though I appreciate it in its place. So to the disgruntlement of the children, and sometimes the husband, I have ever enlarged the garden beds and sometimes surrendered some of them back to the prairie grass beginnings, grudgingly, but of necessity. But grass is my form of nefarious weed. I still plot to take back my front border from its greedy grasp. The ruined pig barn had a trimming of elderberry bushes, and the back acres were farmed… and that is what I found here when first beginning my garden. And that is where I leave us until I write about the garden’s development.